Counting Chickens Long Before They Hatch: Should Hurricane Maria Be Modeled as a Positive Growth Shock for Puerto Rico? Puerto Rico’s latest fiscal plan appears to use a best case scenario as its base case. It consequently doesn’t provide a realistic benchmark for evaluating Puerto Rico’s long-run capacity to pay. One of the most critical parts of any debt sustainability analysis is not the estimated adjustment—though that matters—but rather the forecast for growth. A growing economy makes a fixed stock of debt shrink. A growing economy raises tax revenues, reducing the fiscal burden of paying a fixed coupon. But it also works in reverse. Overestimating future growth can leave a country with an overhang of unpayable debt. Ask Greece. It is also reasonable to think that the flow of recovery aid and insurance funds over the next couple of years will allow Puerto Ricans to rebuild damaged homes and help Puerto Rico make a round of critically needed investments in the island's infrastructure. 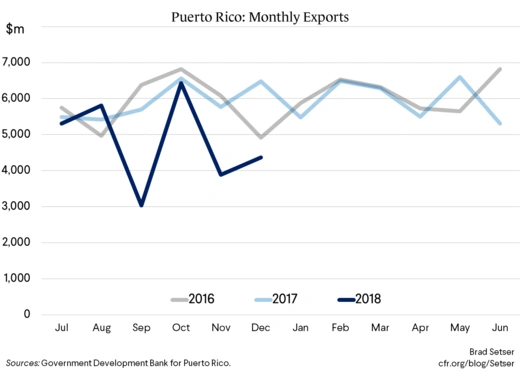 Puerto Rico’s near-term economic trajectory thus seems fairly clear—a big fall in output this fiscal year (Puerto Rico’s fiscal year runs from July to June), and then a rebound next year. The difficulty part of any forecast, it seems to me, is determining a reasonable estimate for the medium-term trajectory of Puerto Rico’s economy. In other words, what happens when the immediate boost from rebuilding fades? Puerto Rico’s economy was in not in good shape prior to Maria. Output was down about 15 percent from its 2006 peak, and there was no particularly good reason to think that the trend decline would change. Residential construction never recovered from Puerto Rico’s version of the broader Sun Belt real estate boom and bust of the 2000s, and a shrinking population has created an overhang of homes. Puerto Rico’s manufacturing-intensive economy was hit hard by global competition—competition from Mexico and Asia for electronics assembly and other wage-sensitive manufacturing jobs, and tax competition from Ireland and others in the pharmaceutical sector. An old fuel oil based electrical grid saddled Puerto Rico with high energy costs and—since the debt used to build the out-of-date system has never been paid off—potentially left Puerto Rico with a significant surcharge on its electric bills to cover legacy debt. Even with increased federal help in the years after the crisis—both through the front door (Obamacare funding for medical care) and the backdoor (the federal tax treatment of Act 154, which allowed Puerto Rico to raise 3 percent of GNP in revenues from a tax on the turnover of multinationals operating in Puerto Rico)—Puerto Rico’s economy was trending down. And, well, Puerto Rico is now poised to a hit demographic cliff. Births per woman have fallen sharply and are now running well below replacement levels. As a result, Puerto Rico is aging rapidly. Even without any out-migration, Puerto Rico’s population is projected to fall. Lyman Stone estimates that the population will fall by an average rate of well over 1 percent a year over the next 30 years. In practice the near-term fall in the population will be substantially higher, as about 2 percent of the population was leaving every year even before Maria, and all available evidence (CNN has pulled together a comprehensive interactive) indicates that the pace of out-migration has recently picked up. ** (The latest fiscal plan projects an average fall of 1.4 percent a year, with much of the outflow front-loaded). This difficult reality was—to a degree—reflected in the first fiscal plan the oversight board approved early in 2017. 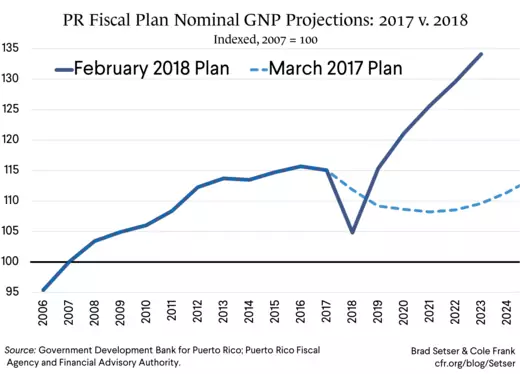 The initial fiscal plan didn’t pay much attention to demographics and included an unrealistic assumption that the Puerto Rico's population would quickly stabilize. But it did recognize that laying austerity on an economy in trend decline would lead to a further fall in output. Output was forecast to fall by about 10 percent over the next ten years, with most of the fall in the first few years of the plan. The governor’s new Post-Maria fiscal plan [PDF] has a very different projected trajectory for output. Maria is effectively modeled as a large positive shock to Puerto Rico’s economy. The rise in output comes even as Puerto Rico—starting in fiscal 2020—is forecast to do some real belt tightening. The proposed measures amount to over 3 percent of (forecast) GNP—which, with the board’s multiplier of 1.3 should generate a drag on output of over 4 percent. (The austerity starts in fiscal year 2020, see p. 35 or p. 39 of the fiscal plan and without any monetary policy offset, there is a plausible case that the multiplier should be higher). At no point during the three years of most intense fiscal consolidation is growth expected to turn negative. And the absence of any real drag on growth from this consolidation is all the more surprising because federal and insurance-financed reconstruction spending is forecast to start to decline in fiscal 2021, which also would—I think—deliver a negative impulse to growth. All in all, it seems a very optimistic forecast. 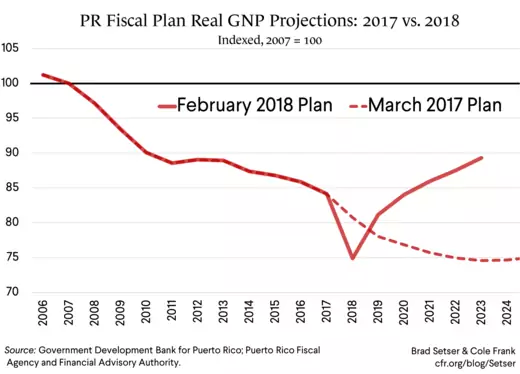 It implicitly assumes a large and rapid payoff from structural reforms that pulls up underlying growth so much that Puerto Rico ends up growing much faster even with belt-tightening and the winding down of reconstruction spending that it did from 2010 to 2016. That seems closer to a possible upside scenario rather than a solid base case. I certainly see how rebuilding could provide a major short-term boost. But I also worry about what happens when the rebuilding ends and the economy must find its own organic sources of growth. Especially as the bulk of evidence from past natural disasters suggests that most natural disasters generally have a persistently negative impact on the economy—rates of growth tend to be lower not higher (in Puerto Rico’s case, that would imply that the underlying pace of decline accelerates). 1) A portion of the $50 billion in federal funds may not materialize. 2) The boom that comes from the immediate infusion of reconstruction aid may turn to bust when the rebuilding is complete and external funding dries up. 3) The drag from the proposed fiscal adjustment could be larger than forecast, depressing revenues and forcing more fiscal adjustment to hit any given fiscal target. 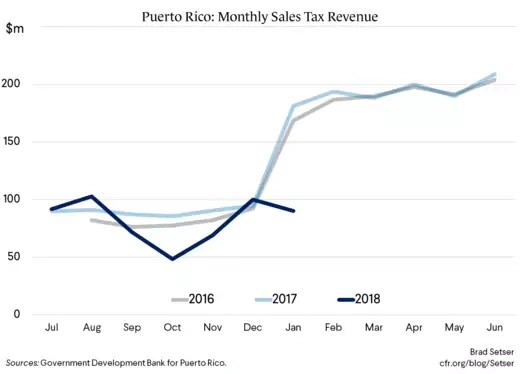 (Puerto Rico does assume it gets less revenue from Act 154 going forward, but the forecast rise in sales and income tax from faster growth essentially offsets the fall in Act 154 revenue: there isn’t a big dip in growth during the period of most intense adjustment). There is a case for optimism. Puerto Rico could, conceivably, put itself on a trajectory where living standards converge toward those in the fifty states—it could "build back better." Stronger underlying productivity growth and rising labor force participation could offset the negative demographics and the strain an aging population naturally places on public services. But the base case used to assess debt sustainability should reflect a hard-headed assessment of the most likely course for an economy that has been in trend decline and faces rising demographic headwinds, not a hoped-for turnaround built on assumptions about the impact of federal spending that has yet to be appropriated and policies that Puerto Rico has yet to implement. 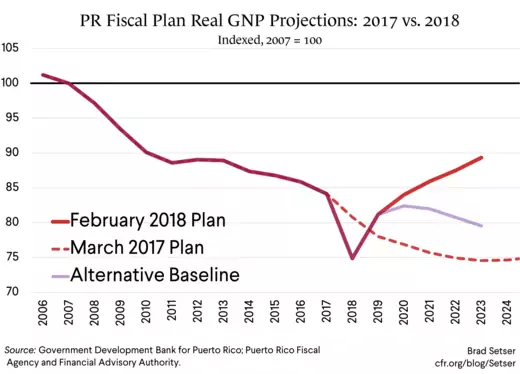 A realistic fiscal plan should be centered around a base case where Puerto Rico’s negative demographic outlook results in an economy that continues to shrink in real terms and is basically flat in nominal terms. The last thing that Puerto Rico needs is a restructuring deal that only works if Puerto Rico experiences a growth miracle—and, absent such a miracle, leaves Puerto Rico with a new debt overhang. The modest fall in December seems to reflect a decision to pull forward some end-of month revenue to the middle of the month. Some of the weakness in January thus seems to be payback for the strong December. More generally, Puerto Rico’s tax collections are back-loaded—Puerto Rico only gets the full sales tax receipts after the COFINA trust has been filled and income tax collections spike in April. It thus is a bit too early to have a clear picture of the full hit to revenues. The fiscal plan forecasts a 10 percent y/y decline in sales tax receipts and a 20 percent y/y fall in personal income tax collections. Exports are also still down y/y—which suggests that the pharmaceutical sector hasn’t fully returned to its normal pace of operations. ** Airline departure numbers, net of arrivals, suggest an outflow of 150,000-200,000 in the months following Maria, so a substantial increase in the pace of out-migration. Five times as many change of address forms have been filed with the post-office as at a comparable time last year (though the absolute number of change of address forms implies a smaller out-migration than the airline data, in part because not everyone who moves files a change of address form if a relative remains behind). See CNN’s interactive for all the relevant numbers and a detailed discussion of these issues. *** Puerto Rico remains an offshore jurisdiction for tax purposes after the recent U.S. tax reform. But it seems unlikely (to me) that Act 154 will be fully creditable against a company’s federal tax. Only 80 percent of foreign taxes paid are exempt from the Global Intangible Low Tax Income (GILTI) provision and some of the companies operating in Puerto Rico may also find that their (complex) tax structures are hit by the Base Erosion and Anti-Abuse Tax (BEAT, a minimum tax on payments to related party subsidiaries offshore, which may capture some firms operating in Puerto Rico that have “inverted” and thus are legally Irish headquartered companies). There consequently is a risk that Puerto Rico may lose out relative to other low-tax jurisdictions for future pharmaceutical production—as other jurisdictions offer the same or better tax treatment, more reliable power, and less hurricane risk. I don’t understand the tax structure of the pharma firms operating in Puerto Rico well enough to feel confident that I have fully sorted out how all this will play out, and would welcome hearing from anyone who has.